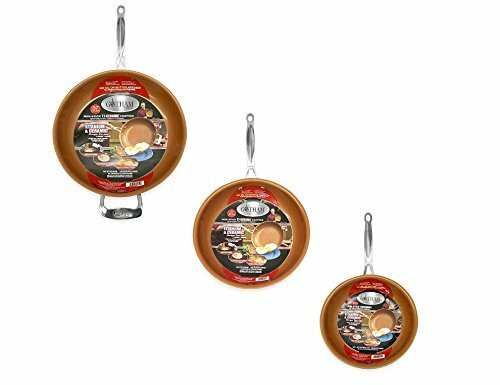 Gotham Steel Pan Reviews - Need a New Frying Pan? You have most likely seen the infomercial about the Gotham Steel non-stick frying pan and are wondering if it really is as it is claimed to be, “non-stick”. After watching and reading many Gotham Steel Pan reviews and actually trying it out for myself, I can say, yes, it is pretty much non-stick, but nothing on the market is perfect. The pan itself is made of aluminum which is a great conductor of heat. The inner coating is what they call, ti-ceramic, which is a combination of titanium and ceramic and is non-stick technology. Both materials are known for their strength and durability. The pans also have stainless steel handles and will stay cool to the touch when frying foods with them. If used in the oven, the maximum heat should not reach over 500 degrees and the handle WILL be hot when you take it out of the oven so use a hot pad. The short handle on the off side of the pan is a great asset when using the pan in the oven. There is a 90 day Money Back Guarantee-Less S&H. If you are not satisfied with the product, there is a Customer Service number on their website for your use. I was disappointed in their website as I couldn’t view all their products, just the one they had on special. When I first tried the 9.5″ fry pan out, I did the egg test first. 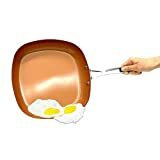 The infomercial shows that the cooked, sunny side-up eggs just slide out of the pan. I had mine on medium heat when I cooked them, and they did not slide right out of the pan. I had to go around all sides of the eggs with a spatula to loosen them up and then they slide out of the pan. I did the same test in the 12.5″ and it was a little bit better but I still had to coax the eggs out. I will say that both pans were extremely easy to clean. I just wiped them out with a moist paper towel after they had cooled. So, 5 stars for the cleanup process. Next I tried the scrambled eggs since they are my favorites. I just couldn’t bring myself to use metal utensils, I never do any other time with my other pans. It looks like they are going to stick throughout the cooking process but when the eggs are done, they are cooked nicely and there was nothing stuck to the pan itself. Clean up was a breeze again except for the stainless steel bolt ends where the handle hooks to the pan. I did have to rub a bit to get the cooked egg off of them. For a person that just hates to do dishes, the easy clean up is a big plus. I have had my two pans for 4 months now and the clean up is still as easy as it was when I first used them. You do have to pay attention to the bottom of the pan and make sure you clean it up too. I find it necessary to use an SOS pad to keep it clean but you have to do that with any frying pan. A week ago I splurged and purchased a thick ribeye steak. With the price of this steak, you know I want a pan that is going to cook it right and not waste my money. I used the big pan and seared it on both sides to a lovely grill looking color and then turned down the heat and finished it off. It was just perfectly cooked and here we go again, the clean up was easy peasy. Even after a deep searing on each side and there was dark brown residue in the pan, it wiped right out but I did notice there is somewhat of a discoloration on the finish. My small pan also has a real used look to it but it still cleans up good. The product still doesn’t have any scratches in the surface but I find that some things are starting to stick but not enough for me to throw it away. I know that they say you don’t need to use butter or oil but I find myself using some of each now, so the food doesn’t stick, depending on what I am cooking. I just want to list a few of the things that bother me about the product. Most of them I can live with, but do you want to? These pans are a dishwashers dream. Yes, you can put them in the dishwasher but you can get them clean enough by just wiping them out with a damp cloth and then using them again. They come in different sizes and they all are coated with a non-stick technology of titanium and ceramic, better known as Ti-Cerama. You can use them on the stove top with temperature near 800 degrees For in the oven with temperatures of 500 degrees F.
Food does not just slide right out of the pan as advertised, at least not for me. After 4 months they are starting to show wear but they are still an easy product to clean. Since we all cook different in amounts, styles and temperatures, one customer can be harder on cookware than another. I hope my Gotham Steel Pan Review helped you in your buys decision.